After obtaining Ph.D. degree in 1993, Dr. Park continued his work with Prof. Kamil Klier at Lehigh University, in the Department of Chemistry as a post-doctoral researcher. Using high resolution X-ray Photoelectron Spectroscopy (Scienta ESCA 300), he investigated surface electronic and atomic structures and their relationship to chemical reactivity on model catalytic systems. 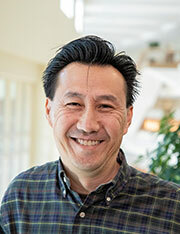 In 1997, Dr. Park joined the Baylor faculty as an assistant professor in physics. In 2004, he was awarded tenure and promoted to an associate professor. In June of 2004, he left for Oak Ridge National Laboratory for sabbatical research. After he came back in January of 2005, he assumed the Director of Graduate Study until May of 2006. He has continued his collaboration with colleagues at ORNL and Louisiana State Univeristy. Dr. Park's research interests have been centered on understanding of surface atomic and electronic structures and their effect toward adsorbates. In the past several years, he has investigated defect formation, their atomic structure, and local stoichiometry on single crystal TiO2 surfaces. Particularly using Scanning Tunneling Microscopy, he studied the relationship between local stoichiometry and structure in nanometer-sized surface defects and their chemical property. Another active research interest involves molecular ordering and thin film structures at the interface between metallo-phthalocyanine (MPc, M = Cu, Ni, Co, and Fe) molecules and single crystal metal surfaces. with V. Meunier, M. Pan, F. Moreau, and E. W. Plummer, Proc. Natl. Acad. Sci. USA 107, 14968 (2010). with V. Meunier, M. Pan, W. A. Shelton, N.-H. Yu, and E. W. Plummer, Surf. Sci. 603, 3131 (2009). with K. Manandhar, T. Ellis, Z. Song, T. Cai, and J. Hrbek, Surf. Sci. 601, 3623, 2007.
with M. Pan, V. Meunier, and E.W. Plummer, Phys. Rev. B 75, 245415, 2007.
with M. Pan, V. Meunier, and E.W. Plummer, Phys. Rev. Lett. 96, 226105, 2006.
with Trinity Ellis, Steve L. Hulbert, Marc Ulrich, and Jack E. Rowe, J. Appl. Phys. 95, 982, 2004.